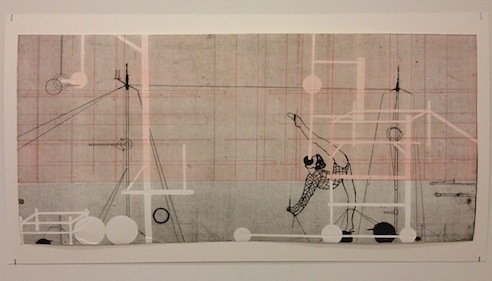 A marvelous selection of prints by 17 Israeli artists is currently on view at LA Print Space at the Pacific Design Center in West Hollywood (until November 1st). 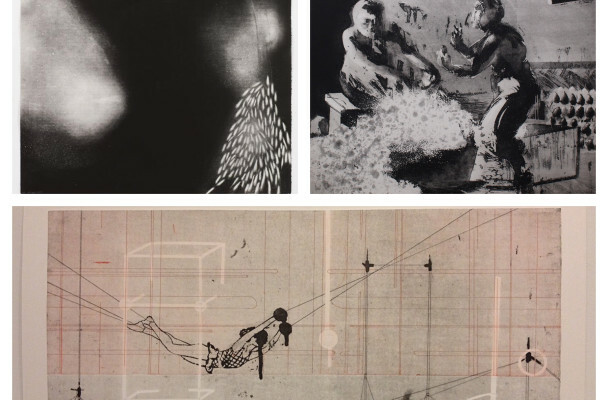 This group exhibition, titled “Layers of Identity”, was tastefully curated by the established Israeli curator, Irena Gordon, which also serves as the curator at the Jerusalem Print Workshop, where all these prints were created. On the one hand, there are Moshe Gershuni’s beautiful and intense vertical diptychs, epically sweeping the viewers into a passionate whirlpool made by the artist’s fingerprints and Dov Heller’s colorful and nostalgic Primăvară series reflects upon immigration overseas, using hand-written letters in foreign language and vague images drawn from what seems like family photos. On the other hand, Avital Cnaani’s almost completely abstract “Black fields”, hold a source of inner light that emerges from within the darkness of the paper sheet, in a manner that might allude to Gershuni’s endless atmospheres in the other room. 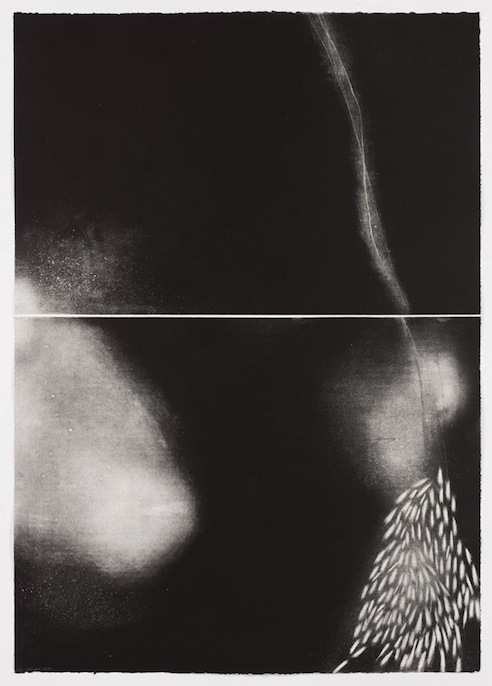 An allusion to the fields-depicting gelatin silver prints by late photographer Dalia Amotz also came to my mind while viewing these etchings. 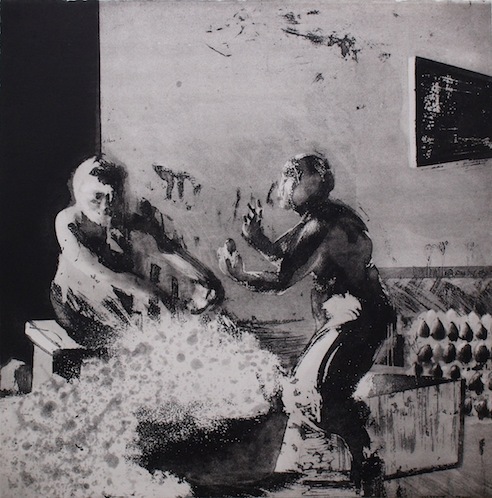 As truly all participants deserve better attention, four artists demonstrated craftsmanship that specifically caught my eye; in an untitled series of dry-point etchings from 1999, Alex Kremer depicts a meeting between two dark figures. At first they seem to merge into one another harmoniously, yet gradually delve into a struggle, perhaps symbolically reflecting upon one and his shadows, or an animalistic collision between desire and self restraint. Hilla Ben-Ari presents a female acrobat that seems both practicing her physical skills, while being tied by cords, that limits her ability to move freely. 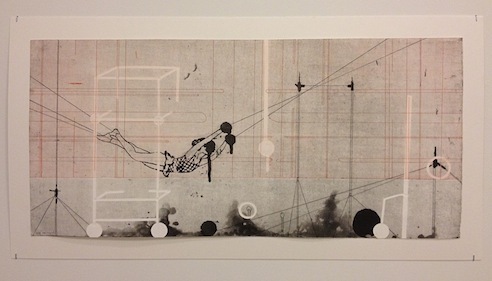 Ben-Ari’s exquisite use of etching, sugar-lift, spit-bite and embossing techniques, creates an almost 3 dimensional trap, in which the athlete tries to move, as a puppet that wishes to break loose of its strings. Andi Arnovitz’s fascinating series of portraits is based on true cases of women that had been violently attacked by men, who had thrown acid on their faces. Some of these women’s hair is covered, alluding to certain cultures where the objectified female is forbidden to act as she wishes, and is “punished” in cases of allegedly acting again norms, while some seem secular, broadening the moral picture of this body of work into a more general depiction of misogyny. 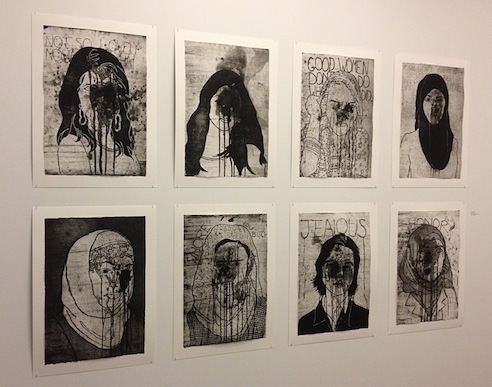 Arnovitz’s mixed use of etching techniques, along with the texts she had written at the background of the figures, sums up into a horrid and unfortunately timeless and sector-crossing imagery of the feminine battle ground, continuing to this day. Youngest of participants, Meydad Eliyahu, demonstrates a remarkable talent for creating a sense of volume and movement in his “Little Scratches” works. 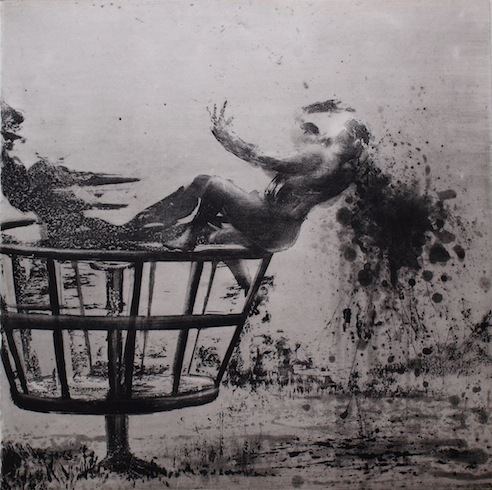 All his figures are caught in between actions, while spinning or on the verge of falling. This crucial point of the unknown and unexpected bursts into the ordinary and leaves its mark on the individual’s memory. The permanent nature of the printing procedure, unites with swift brushstrokes, becoming tangible as a blink of an eye. As the exhibition’s title implies, these personal layers get built by experiences, some are unreadable and others’ reconstruction is continuously being sought after, all are shaping the imprint of each one’s identity.